Warning (Opportunity) – Opportunity to plan ahead for the EU and its member states, as well as worldwide? Independence is meant to be declared by Catalonia President Carles Puigdemont on 10 October 2017 afternoon. Meanwhile, Catalonia secessionist political leaders would have also been trying to broker a deal with Spanish Socialists, Podemos and the Basque Nationalists. Such deal would then allow forcing Prime Minister Rajoy out and, most probably, trying to replace him by a leader that would not only accept Catalonia Independence but also work with Catalonia to make it possible, i.e. it would take place in a constructive way. According to Bloomberg (below), it is unlikely that the Socialists accept. Yet this would most probably be the least dangerous and unpalatable way forward for both Spain and Catalonia. Yet, should this unlikely scenario come to occur, the impact would be huge for the European Union and its member states, as others could follow Catalonia. It is here necessary to remind that neither the European Union nor its members, nor for that matters all actors, should find this evolution of events surprising. Indeed had they paid attention or applied the knowledge offered by political science on nationalism, nation-ness and nation-building they would know that if one changes the modern-state, then one also has an immediate impact on the nation. It has indeed been shown by the modernist theoreticians of the nation, such as Gellner, Smith or Anderson, that the nation is a child of the modern-state. As the European Union is, by essence, changing the structures and the process of the modern state, then it follows logically that the nations that existed will also be impacted. Those nations that were thought as coterminous with the modern state in its borders are no more. They have evolved under the actions of both the European Union and the weaker and changed states that have become its members. 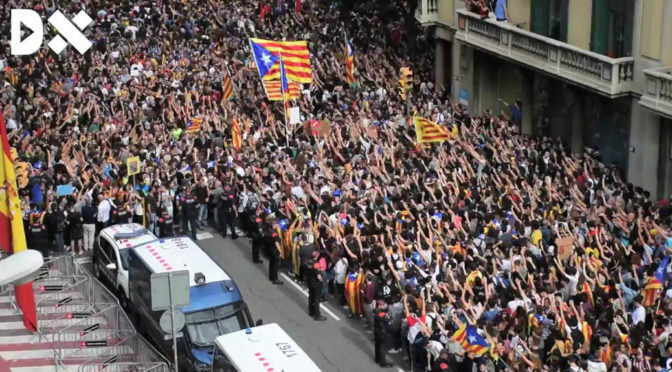 These are dynamics that must be considered as peacefully as possible – and as properly and constructively as possible – as they will not stop but, on the contrary, are highly likely to continue, not only in Spain but also elsewhere. We can even go further that the European Union: the decades of “globalisation” and neo-liberalism having deeply impacted the state, the phenomenon at hand may not only be European, but … global, and should be envisioned as such. Here because for once policy-makers and decision-makers are forced to confront political dynamics they either did not understand or denied, we have a larger opportunity to anticipate properly the future and thus to design correct courses of actions, according to objectives. Further, Bloomberg’s article uses – at last – scenarios to envision the way the situation may evolve between Spain and Catalonia. However, they limit themselves to the very near future and stop short of really envisioning consequences, indeed shying away from it with a “what happens next is anyone guess”. Well, this is not anyone’s guess. Scenarios may and actually should be constructed already past this very short-term future. Understanding of escalation, crises and conflicts, as it involves identity politics and nationalism – i.e. political science and international relations – has a lot to bring to the building of these scenarios, that we shall see anyway unfold in the future. ➘ ➀ No declaration of Independence + No Emergency: Back to the previous situation, stabilisation . Catalan secessionists have opened a second-front in their campaign against the government in Madrid, urging the opposition Socialists to forge a coalition to oust Spanish Prime Minister Mariano Rajoy, according to two people with knowledge of the outreach.